your hard-earned money for yourself to enjoy! costs are just one reason most tiny & mini home dwellers own their homes. lengthy and expensive mortgage payments. 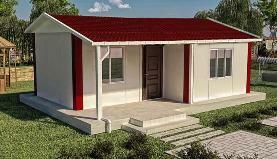 who choose “mini-home life”, the rewards are often enormous. liability, for home owners that would like to rent out their properties. 3. Bookkeeping: Provided for Home Owner..
schedule a renter can immediately see what days are available for rent. extra income to fund your passions. you pick the times are most convenient for you and your family; and the frequency. In other words, you are in total control of your rental units. floor tiles come with the home? underground pipes, as well as, sewage treatment according to the local codes. Your local contractor should be able to help you with this. whole unit, thus changing the way of the EPS plate is assembled at the site. much attic space is available, if any? inches from roof. There is no attic space available. passed via the roof. Will meet all building codes according to your township. purchased. Normally 3-4 persons daily usage. the Shire, we will advise the size. Double slope roof on an EPS panel and asphalt shingles. 11. What is the tested wind factor on the buildings exterior walls? unloading entrance details for an accurate delivery quote. final destination, to be incorporated into the home design plans.